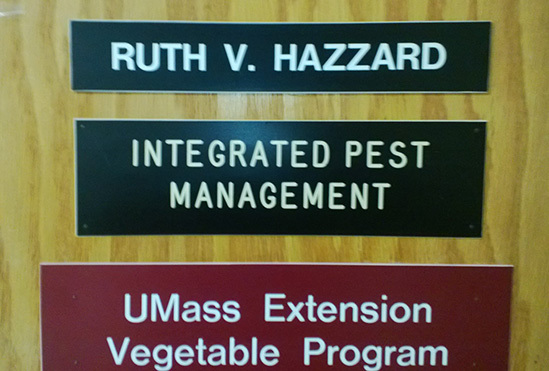 Hazzard began her career in Extension at the University of Massachusetts as a specialist in Integrated Pest Management, or IPM, as it is known. At that time, the Extension Vegetable Program’s regional agents included John Howell, Alden Miller and Dominic Marini, as well as several other faculty and staff. Regional agents were able to consult on farms across the state as they offered “boots on the ground” advice. Over the decades, the work environment changed as resources dwindled, leading to positions going unfilled when agents and faculty retired. While the essence of the work Hazzard has always done may have changed very little, her portfolio has grown as she assumed the work of her fellow specialists as they retired, one-by-one. Through the 1990’s, Massachusetts experienced a decrease in the number of vegetable farms across the state. However, that all changed about a decade ago: it seemed as if the fast forward button got hit at some point in the first decade of this century. The current resurgence of farming in the Bay State has resulted in farm numbers increasing. Hazzard is excited to witness the new energy as the next generation takes the reins on both new and established vegetable farms, as well as more diversified farming businesses. Over the years, much has transpired under Ruth’s leadership. Her efforts through grant applications and collaborations have brought in over $1,000,000 for Extension. 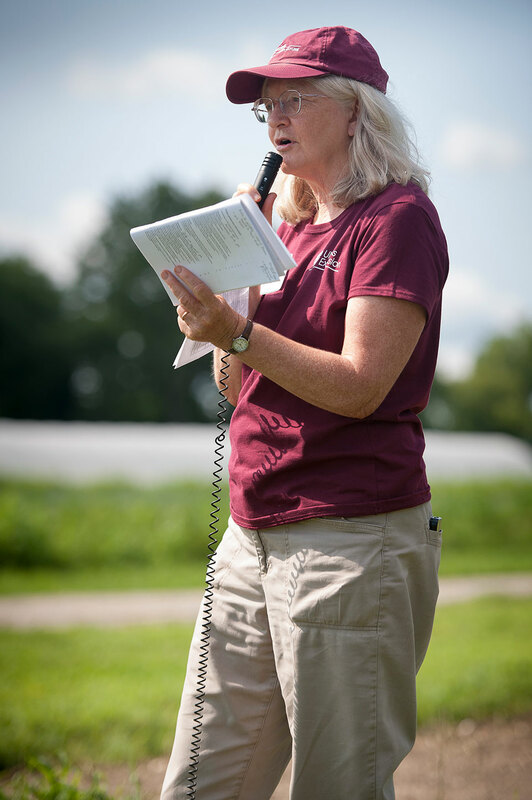 She carried out many field-based research projects in entomology and plant pathology, helped coordinate the writing of the biannual New England Vegetable Management Guide, published the revered UMass Vegetable Notes to over 2,000 subscribers weekly during the growing season, scheduled twilight meetings at farms, organized field days, and produced many educational programs. Her summer scouts have scoured vegetable fields in Massachusetts for insects and diseases and their findings have been reported electronically to the farming community. Hazzard’s work has been enriching the knowledge of farmers across the Commonwealth for over 25 years. Hazzard reports attaining her greatest job satisfaction when she worked with farmers on their farms. When she has been able to pay close attention to their concerns and has solved a problem, the result has been gratifying in many ways. Along with the pure education and outreach extended to these farmers has come the building of lifelong relationships and real friendships. The freedom to tackle difficult problems and the opportunity to work with “really great people” has given Hazzard a sense of gratitude for her work. From her vegetable patch, the future looks bright. Hazzard sees in new faculty and staff a deep interest and willingness to reach out across the university and outside of it, to work in partnership around related work. She believes such cooperation can be fruitful on all sides. Advice for Next Vegetable Specialist? What advice does she offer her replacement? “Organize projects that get you on farms. Although it is daunting to know you are one person with hundreds of farms, you can be useful,” she suggests. Her strategy has been to find ways to share the real fieldwork and research with many farms beyond the ones she works with. One successful method has been sending out “Vegetable Notes,” a weekly newsletter full of timely tips for farmers. Growers get immediate feedback on issues such as pest alerts, scouting tips, management recommendations, current crop conditions, and other topics. Where Will We Find Ruth Post-Retirement, late June, 2015? 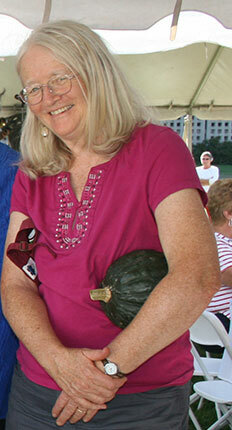 Not surprisingly, she plans to enjoy home gardening on an acre of great soil and intends to build a greenhouse. One might hear the tinkling of ivories or the pure sounds of a recorder and singing as her musical side will have some space and energy to re-emerge. And she will hang out with her family. She doesn’t know what direction her involvement with agriculture will take her next, but she is sure that she’ll continue to be active in some way. Sounds like a perfect plan. If you would like to attend Ruth’s retirement party, Monday, June 29 at UMass Cold Spring Orchard and Education Center from 4:00-7:00 p.m., click here  to download details and to RSVP.